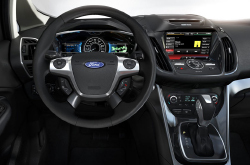 So - you're here - which means that you want to research Ford's all-new crossover-wagon inspired hybrid. A wise decision. If you're wondering why you should choose the 2013 C-MAX in Phoenix, Arizona over its well-known competitor, the Prius v, read on. First, realize that you are not alone. Hundreds of other Toyota hybrid shoppers have also been lured in by the C-MAX, and your Toyota hybrid owning friends certainly won't make fun of you for driving a Ford when you tell them these facts (they might even get a little jealous). Numero uno: The 2013 C-MAX at Peoria Ford is more efficient than the Prius v, delivering 47 MPG city and highway. So you can reduce your carbon footprint and save significantly on gas, while enjoying a few bragging rights too. Numero dos: When you come test drive the C-MAX at our Phoenix area dealership, you'll find that the prices you've been seeing online are indeed truly lower than the Prius v's base price. For these reasons and more, thousands of people have chosen the C-MAX at Peoria Ford over the Toyota Prius v. If your decision to buy the new 2013 C-MAX isn't already solidified, read a full review below for further details. By examining the 2013 Ford C-Max head-to-head with the 2013 Toyota Prius V, Nissan Rogue and the Chevrolet Equinox, and you can spot that the C-Max beats out those autos in many zones. Check out the hightlights below. Don't travel to a megacorp car repair shop in Phoenix when Peoria Ford's phenomenal C-Max experts are only a brief journey away from your house. We also give a long-term warranty on our services - more than most megacorp shops do. Your C-Max will run at top level with support from the masters at our Phoenix service center. Whether you need us to take care of a effortless job as an oil change, or take on hard to do Ford service and repairs like transmission rebuilds, strut and shock repairs, timing belt replacements. Above this, Peoria Ford offers hassle-free customer service and modest prices. Check out our service specials by clicking on the link below. With a solid 47 MPG and a lower base MSRP than the Prius v, Ford's C-MAX offers both greater efficiency and greater affordability. Nearly 70 percent of the C-MAX's buyers had previously never owned a Ford before, a statistic which clearly reveals that some Toyota shoppers are migrating and choosing a more appealing option. 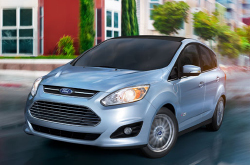 It's no wonder that in its first month of sales the C-MAX outsold the Prius v.
If you're interested in purchasing the 2013 Ford C-MAX Energi in Phoenix, AZ, you're also headed in the right direction. The Energi outperforms the Prius Plug-in when it comes to MPGe, and trumps it in several other key areas, as well. Whether you want to save money on gas or minimize your carbon footprint, if you're shopping for a vehicle with optimal efficiency, the Energi achieves a segment-best 108 MPGe. It also offers far greater horsepower than the Toyota plug-in, delivering 195 hp. And, on top of this, it has a class-leading EV speed of 85 mph, which also far exceeds its Prius competitor. Learn even more about America's most fuel-efficient and affordable plug-in hybrid and hybrid utility vehicle at Peoria Ford! Contact us or stop by today to see them up close and get information about current Ford incentives.